Think "out of the box"! The fact of developing one's own distinctive elements that allow the individual to assert his/her own particular traits and individuality, constitutes an objective of prime importance for the majority of people. Nevertheless, no less secondary is the manner in which one attempts to pursue this goal. It is certainly not rare to discover in the majority of cases how this search for "distinction at any price" (perhaps even only aesthetical as a means in itself) often produces somewhat dubious results, completely lacking in terms of good taste, if not downright banal. 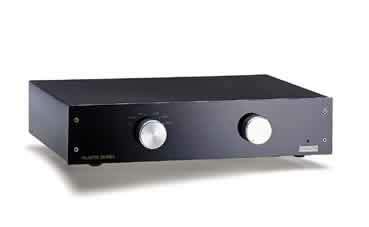 This Plastic 25, an integrated solid state amplifier produced by Industrie AUDIO VOX® (a young, up-and-coming Florentine company forming part of the Bluenote group that also manufactures digital record players, loudspeakers and assorted accessories), is certainly not lacking in an abundance of distinctive features. And they are all concrete elements, deeply philosophical and anything but ephemeral. However leaving aside the aesthetic aspect which, in its simplicity with a front panel in black Perspex creating a pleasant contrast with the consistent sizing of the two natural aluminium knobs, asserts its own distinctive personality formed by discretion and elegance. We shall also overlook the practical aspects that foresee the on-off switch on the rear panel, quite far from the main controls (volume and 4 input line selector, one of which can also become a MM/MC Phono), almost as a warning again turning OFF too often. The real difference lies in the interior of the device and the design choices opted for. The Plastic 25 is an integrated amplifier with 25 W continuous and a peak of 100W per channel, manufactured using materials that enable it to be completely diamagnetic. The frame, in fact, is made in aluminium, steel, brass and polymer resins. The boards are fixed via nylon spacers and the limited number of screws used (with instead a generous use of especially designed 3M® adhesive tape) are in stainless steel for preventing any sort of electromagnetic interference in the circuits. The design has tried to reduce to a minimum the use of power supply condensers, and the inductances have been completely eliminated. The rest consists of capacitors in polypropylene and polystyrene, 1% metallic film resistors and VISHAY CERamic-METallic potentiometers. It must be noted how the volume potentiometer operates using a linear scale instead of the more common logarithmic one, being the reason why it is perfectly normal for the same to be rotated in a significant manner during listening. The completely air wiring and carried out by hand, consists of solid core cables and rectangular section bars, all in OFC copper. The design foresees the use of two small 10 VA power supply transformers (used in coupled 20 VA mode) each patented and marked INDUSTRIE AUDIO VOX®. The dimensions are 43 x 9 x 35 (L x A x P), and its weight, obviously influenced by its design features, is limited to a mere 6 kg. On demand it is also possible to equip the device with a phono board (MM/MC) and an output for a headphone connection (at the rear panel). "solid core" cables and rectangular section bars in copper. This is the classical product in which its overall value outweighs the sum of its individual components. Listening becomes a true pleasure, distracting you from the analysis of the usual parameters and catalyzing the listener's attention on the beauty of the sound produced, the reproduction of a musical event in which the musicians have invested their souls, hearts and all their skill. This is an euphonic sound in the most positive sense of the word, obtained without any particular sacrifice in terms of neutrality or transparency, and which I shall try to describe in the following comments. The extension in frequency appears to be substantially complete and no significant lack is perceived in the very low range where, considering the more or less average-economic extraction of the machine, it would be legitimate to expect an honest performance and nothing more. Round and full bodied in the medium-low range, it flows over a velvet carpet with fluidity and warmth towards the medium range, concluding its tonal itinerary in a suave and mellow manner (as well as extremely consistent), gently embracing the higher ranges of the acoustic spectrum without any harshness and also without perceiving any particular sense of "closure". In such a well-textured context we could presume the control and articulation of the medium and low ranges to be elements which are sacrificed on the altar of softness. This is far from the truth, and our little "winner" instead proves to be exceedingly well-endowed in backing up and restoring the virtuosity of the musicians, without any haste whatsoever or resorting to a flurry of nervousness, demonstrating unexpected skills in driving even the most difficult speakers. The introspective skills are also good, excellent if we consider the price of the system. In view of the musical context described above however, it is evident that we cannot expect that hyper-definition typical of systems with a dryer, more crystalline timbre that at times, be it with relative quality, gives the idea of possessing an elevated transparency and introspective capacity rather than actually owning it. The harmonic content is very good, faithfully respecting the timbre of the instruments, and the sound gushes forth in a fluid, liquid manner in an overall picture dominated by warm, elegant pastel shades, which while conveying the contrasts without overly emphasizing them, does not prevent us from appreciating the architecture of the sounds. Remarkable the dynamic performance, conveyed with a decisive force though never blaring or hurried despite being contained in a mellow, never frenetic context. However, it is more a question of coping with situations armed with the confidence of knowing how to impose one's own personality, consistent and imperturbable, and not lacking in a certain touch of class. The image reproduced is somewhat "intimate". It does not propose wide open spaces, though it does turn out to be very harmonic, with a good general three-dimensional expansiveness, equilibrated in its proportions. The elements are well arrayed, stable and of appreciable substance, somewhat flexible with soft, hazy contours. An interpretation that manages to give the sensation of an infra-instrumental air which, while not being something that warrants the proclaiming of a miracle does however present such valid and agreeable characteristics that yet again one inevitably ends up concentrating exclusively on listening to the music. A good sense of realism, favored by the sense of concreteness deriving from the harmonic fullness as well as a certain "forward" effect that projects the more consistent elements of the sound box forwards. Considering the market price of the unit I could say it is practically impossible to find any musical defects in the Plastic 25, seeing that it incorporates a combination of characteristics melt together in an extremely harmonic, and quite frankly, praiseworthy manner. Perhaps, and I repeat perhaps, at times one could desire a touch more lucidity and depth in the medium-high range, but that's all: the risk is in fact that of distorting the character of an extremely successful product. The Plastic 25 is just the thing for attentive, shrewd sound-buffs who love music above all else. If you try to judge it without possessing an adequate listening experience, and perhaps hastily compare it with other more "aggressive" competitors, then you run the risk of not understanding it at all. Neutral, transparent cables and a balanced, harmonic source rich in timbre from the medium range upwards, all contribute towards ensuring top-of-the-range results. With regard to the speakers, just avoid those with an excessively low sensitivity, considering that the impedance of the same doesn't seem to represent any serious problem. I wouldn't want the unit's main advantage in the long run to become its main defect: namely, its market price. In fact, expert sound-buffs who are often willing to pay considerable amounts in order to satisfy their passion (a very "sound" passion by the way) may not be enticed by systems belonging to this price bracket. The less expert people who are less inclined to spend a lot, could on the other hand be more attracted by those systems that are far less valid quality-wise but which have a more aggressive look and sound (and here they can always find something for around 500 bucks), even better if distinguished by a particularly significant weight (it's amazing to note how that widespread and equally unfounded belief that equates the quality level of a system with its weight, is so deeply rooted as to be one of the most difficult to eradicate ...). As confirmation of this theory and the importance that some professionals in this sector give these marketing strategies, we only need observe the consistent rises and drops in price which certain products undergo with a change of distribution (sometimes even more than 50%). 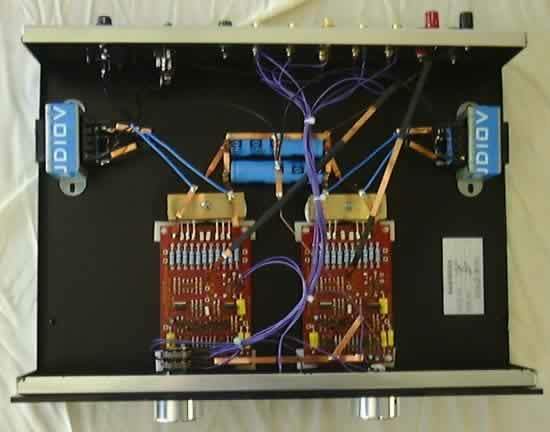 My opinion is that in the light of the results obtained, this amp musically expresses a far higher value than its cost (obviously in relation to the current market), thanks - above all - to a particularly successful design which can easily be inserted in reproduction chains consisting of components costing much more than the Plastic 25 (as a good judge...). My heartfelt thanks to Industrie AUDIO VOX®, and in particular, Maurizio Aterini, for the kindness shown to me in making this extremely musical integrated Plastic 25 amplifier available for the listening test.